All programs are operated to first serve the needs of members of the Coquille Indian Tribe, then members of the Confederated Tribes of Coos, Lower Umpqua, and Siuslaw Indians, and then other Native Americans and Alaska Natives. Eligibility is further determined by need, income, references from landlords and credit providers, criminal background check, and household composition. Read the latest edition of the Coquille Indian Housing Authority’s monthly newsletter, the Sea-Ha Runner, or browse our Sea-Ha Runner archives. The Low-Income Rental Program assists families with rental housing on Tribal Lands. Required monthly rental payments are based on a maximum of 30% of the household’s adjusted gross annual income. Unit size is determined by family composition. The MHAP Program is a tenant-based, monthly rental assistance opportunity designed to help low-income Coquille Tribal members and other Native Americans pay rent for privately owned, decent, safe, and sanitary housing. The program is modeled after the HUD Section 8 Voucher Program and is similar in its operation. Units of assistance funded by HUD are available to low-income Coquille Tribal members and other Native Americans in Coos, Curry, Douglas, Jackson, and Lane counties in Oregon (ISA MHAP). Units of assistance funded by the Coquille Indian Tribe are available to low-income Coquille Tribal members throughout the United States (OSA MHAP). Click here for OSA MHAP FAQs. The purpose of the Emergency Housing Program is to provide special, short-term support to qualifying Native American individuals and families who are in crisis due to lack of housing and circumstances beyond their control. To be eligible for Emergency Housing, the applicant must be referred by a recognized local social service agency which assists families in crisis. The HomeGO Program allows qualified low-income Coquille Tribal families who are participants in the Low-Income Rental Program on Tribal Lands to transition in place to a lease-purchase homebuyer agreement with a small down payment and low monthly payments. Under this program one-half of the cost of a home is granted over a 10-year period and the other half is paid back to CIHA over a 25-year term. The loan is re-amortized annually based on the current national average interest rate, capped at 6%. The HUD Section 184 Loan Program provides loan guarantees for refinancing, construction, and acquisition of single-family homes for Native Americans. The loan guarantee may cover up to 100% of principal and interest for up to a 30-year fixed rate loan. Borrowers pay a small down payment and loan guarantee fee. Approximately 41% of monthly income may be dedicated toward a mortgage payment. There are no maximum income limits. Application may be made directly to any federally-approved lending institution under this program. For more information, please contact the CIHA office. 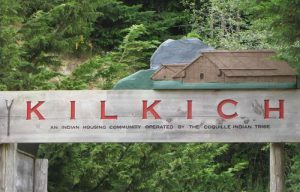 The PRL Program allows qualified Coquille Tribal members to lease a residential lot on Tribal Lands for construction of a privately-financed single-family home. CIHA administers this program on behalf of the Coquille Indian Tribe. Applications are accepted on an ongoing basis and selection is made by random drawing from all qualified applications on hand at the time new lots become available. There are no maximum income limits. For details, please refer to CITC Chapter 420, Private Homeownership Land Leasing Ordinance. Click here for a FAQ sheet and application for the program. Click here for information about income limits applicable to programs funded by the Native American Housing and Self-Determination Act of 1996. Please contact CIHA for assistance determining the income limits applicable to your area. Use this link to see if you are eligible for other HUD programs and social service programs available in Oregon: http://www.oregonhelps.org. Try this website to find out if your family can get help from 28 different services. Oregon Helps does not ask who you are and does not share your information with anyone. Have an idea you’d like to share? Click here for a CIHA suggestion form. In cooperation with Oregon Coast Community Action’s Low-Income Energy Assistance Program, Coquille Indian Housing Authority staff facilitate program participation for Coquille Tribal member households in Coos and Curry Counties and other Native American or Alaska Native households residing on Coquille Tribal Lands. This program provides a direct payment to a heating vendor to offset the cost of home heating during the winter months for low-income households. A Tribal program that provides emergency financial assistance, enabling income-eligible Coquille families to make necessary home repairs that would affect the health and/or safety of household members. Contact the Tribal Public Works Department at 541-756-0904 or click here for an application packet. Coos Bay Tsunami Evacuation Brochures are available at the CIHA office. Click here for links to information and resources to become prepared. Matching savings program (typically $3 match to every $1 you save) for homeownership, home repair, small business, and other goals.